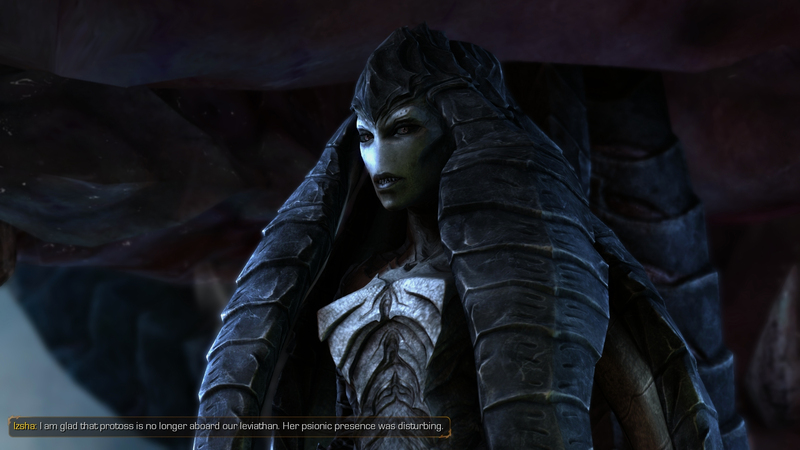 Izsha: My queen, your transformation has altered your abilities. If you wish, you can review the changes within your chamber. 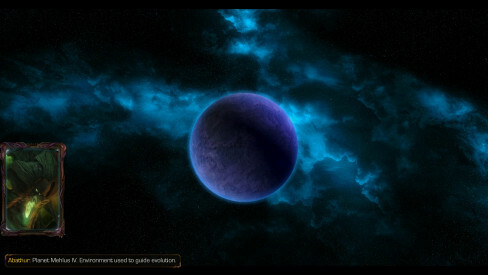 Izsha: You have become strong and taken another world. I think you will conquer the universe. 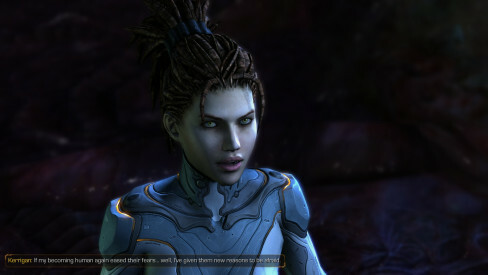 Kerrigan: I don’t know about that. 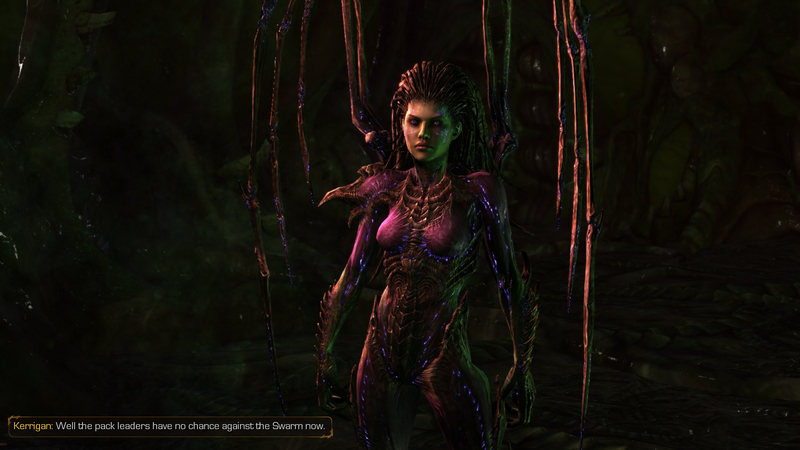 But the zerg will never again be pawns of other races … not even the xel’naga. Kerrigan: We have changed. And now, other worlds await. Kerrigan: Did you know the Ancient One would turn on me? 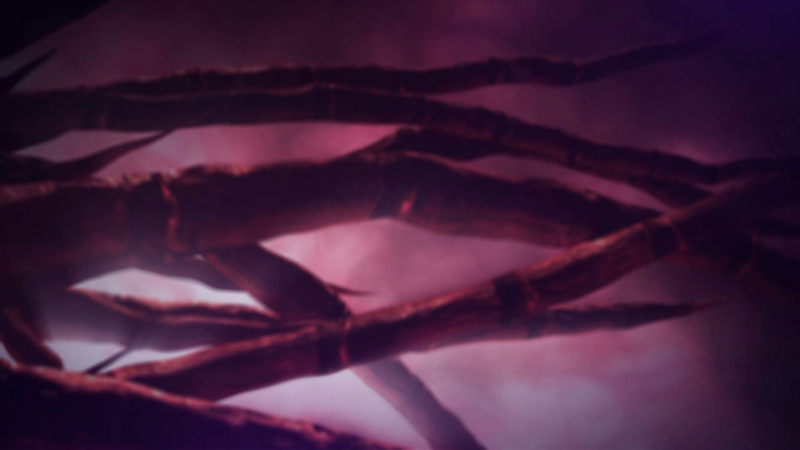 Dehaka: Your essence. It called him. Kerrigan: And you didn’t try to warn me. Dehaka: He was zerg. You are zerg. One dies and one grows strong. You know. 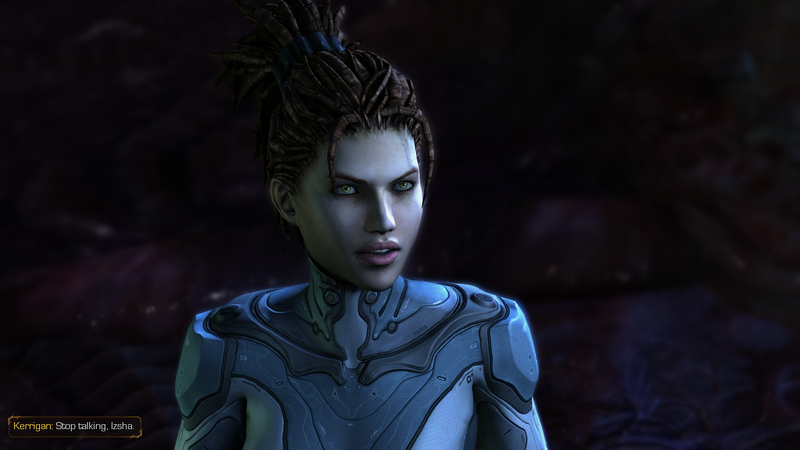 Kerrigan: I think I am starting to understand you. Dehaka. 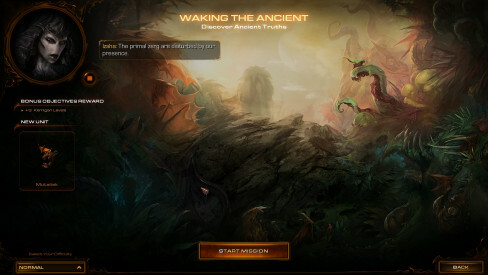 Izsha: The powerful essence of the primal pack leaders has awakened a new column and many abilities. As new tiers of abilities continue to awaken, you will gain abilities in this third column as well. Kerrigan: Tell me about your work. Abathur: Look at flesh, see only potential. Strands, sequences, twisting, separating, joining. See how it could be better. Abathur: Eat flesh, splinter bone. Inside me, can touch it. Weave it. Spin it. Make it great. Abathur: Never perfect. Perfection goal that changes. Never stops moving. Can chase, cannot catch. 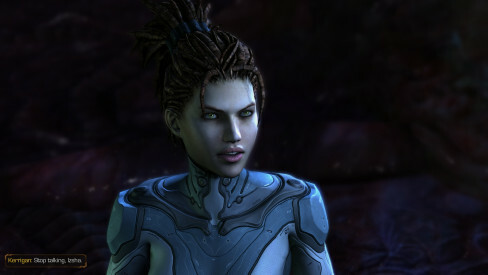 Kerrigan: You certainly have your uses. 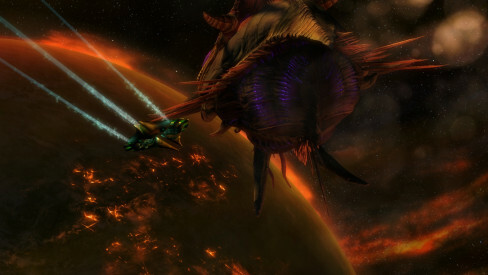 Kerrigan: Izsha, what is a primal zerg doing on my leviathan? Dehaka: I am Dehaka. One-who-collects. I kill, I take essence. Now I come to you because I feel your change. All Zerus feels it. All Zerus fears it, and you. 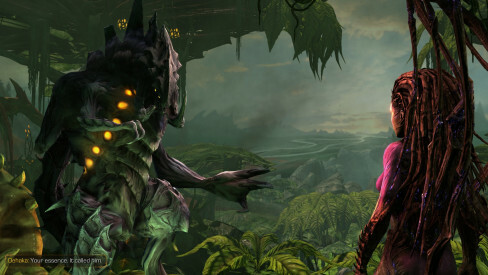 Kerrigan: But you don’t fear me, do you, Dehaka? Dehaka: You shine. You will bring more essence, and I will follow. When you do not, I will not. 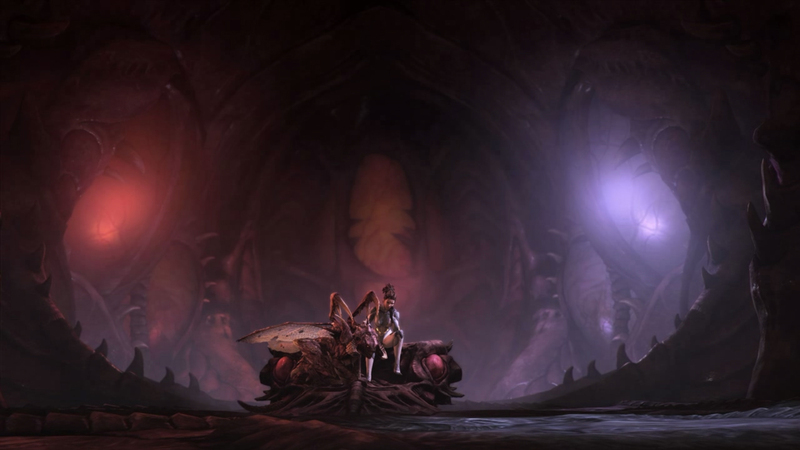 Kerrigan: Well, I’ve forged alliances on shakier ground than that. Very well, you can stay. Betray me and I’ll collect your essence. 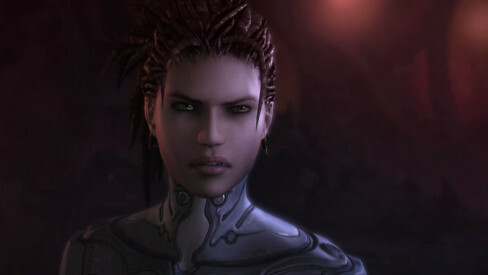 Kerrigan: Do you think the remaining pack leaders will join me now? 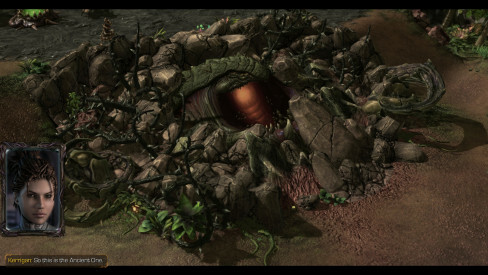 Dehaka: They are a rock, a tree, a hill. They will stand against the wind. They seek power. Dehaka: I am a river, I flow. I seek essence. Kerrigan: Well the pack leaders have no chance against the Swarm now. Dehaka: They gather essence for thousands of years. They are blinded. But they are not foolish. Zurvan: You have been reborn. A primal pack leader of boundless power. 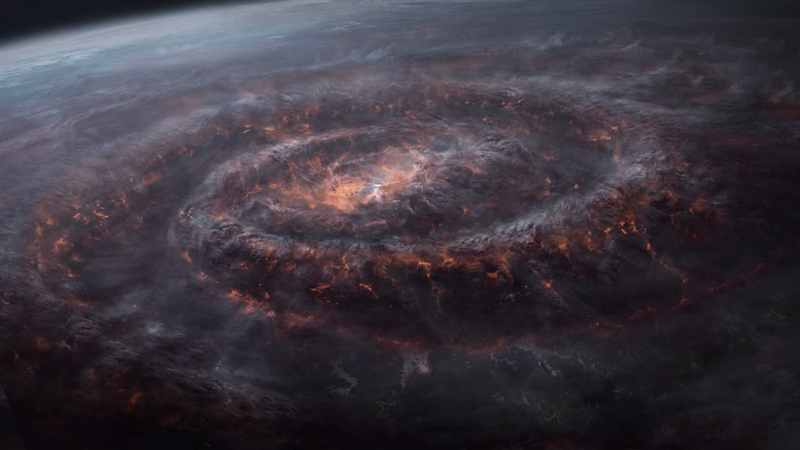 Kerrigan: I feel as if I can rip worlds apart. 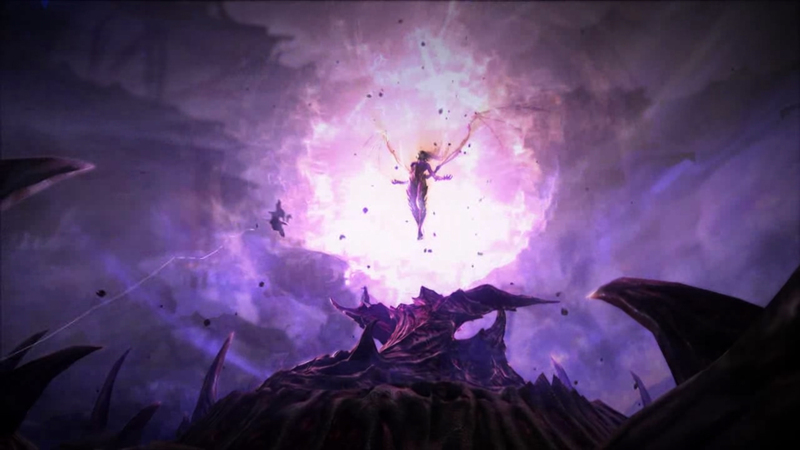 Zurvan: And are you the equal of Amon, who once controlled you? 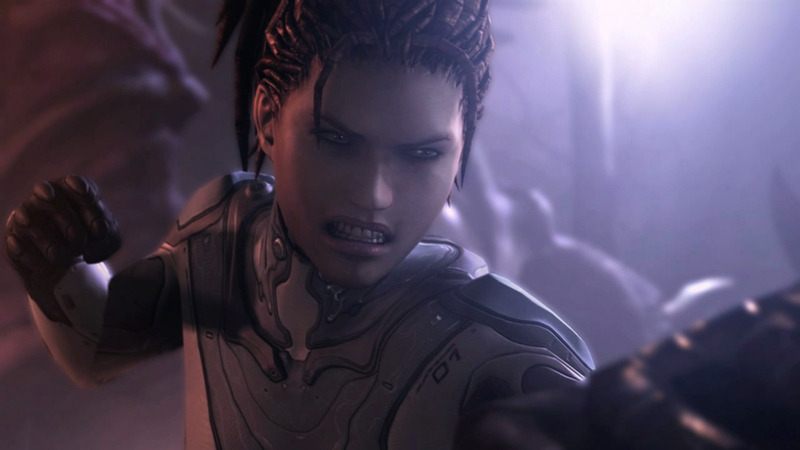 Kerrigan: He never controlled me. I felt … an influence. A trace of something dark, but long gone. Amon must have died before I was infested. Zurvan: I hope it is so. For he truly could rip worlds apart. Izsha: You radiate so much power. More than the old Queen of Blades ever did. 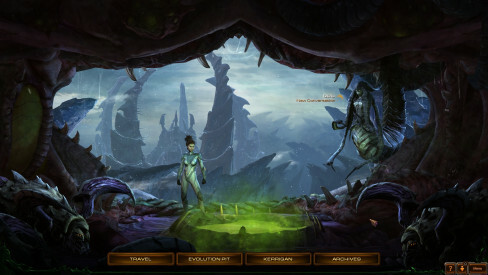 Kerrigan: Everything is different. I could always hear the Swarm, control it. But now … I feel the Swarm. Now I am the Swarm. Abathur: Genetic strands different. Restructured from base level up. Stronger than Queen of Blades. Sequences complex but clean. Completely different at core. 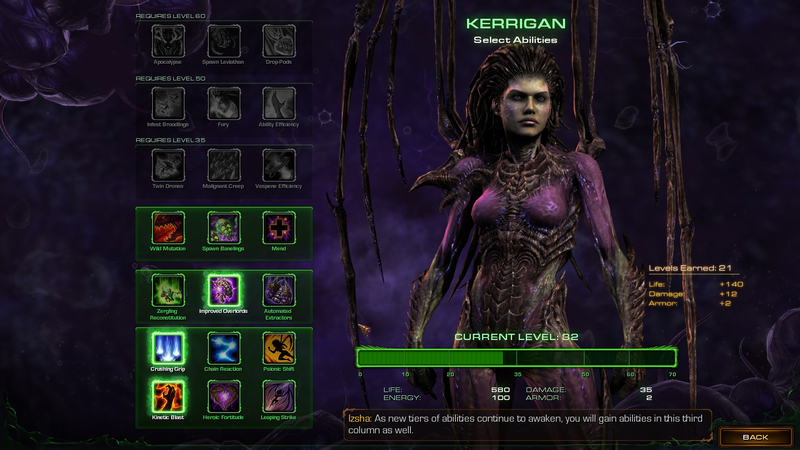 Kerrigan: Yes, I am different. I am my own master. When the xel’naga artifact made me human again, it cleansed me of Amon’s influence. And that allowed me to become … something greater. Abathur: Must take sample. Study new sequences. Kerrigan: Don’t even try, Abathur. What I am now, is beyond your comprehension. 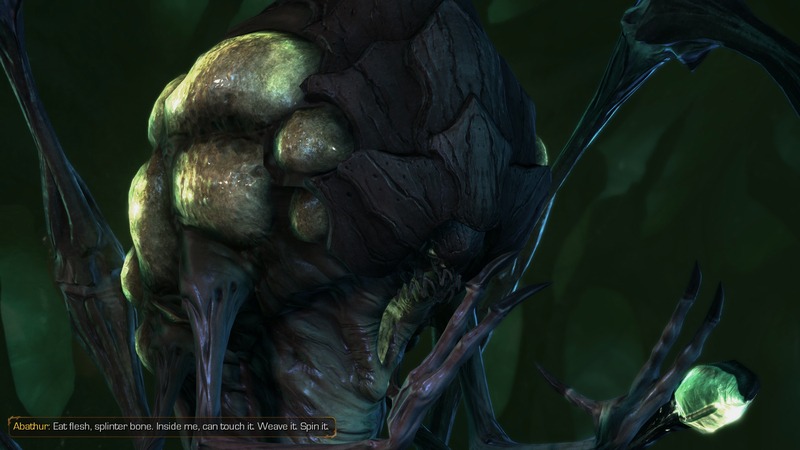 Abathur: Difficult to admit. New structure beyond understanding. Will return to work. 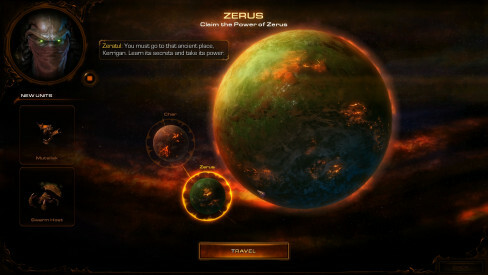 Zurvan: Travel to the birthplace of the zerg. There you will be tested. You may be torn apart. If your rage makes you strong enough, the power of Zerus will be yours. Zurvan: You have come to this place seeking power. Kerrigan: Power to kill Mengsk. Tell me what I must do. Zurvan: The power is more ancient even than I. It comes at great cost. What will you sacrifice to have your revenge? Zurvan: You must feel the power. It calls to you. Go to it. Izsha: The primal zerg have been alerted to your arrival. They are coming for you. 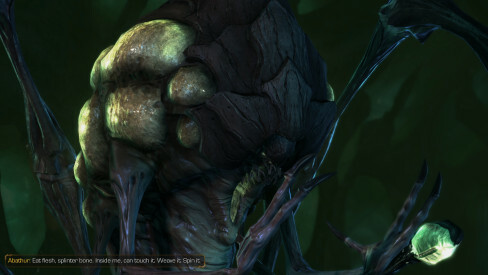 Kerrigan: Abathur, send me the creature you’ve been working on – the swarm host. Abathur: Adapted using primal essence. Spawns locusts to kill enemies. 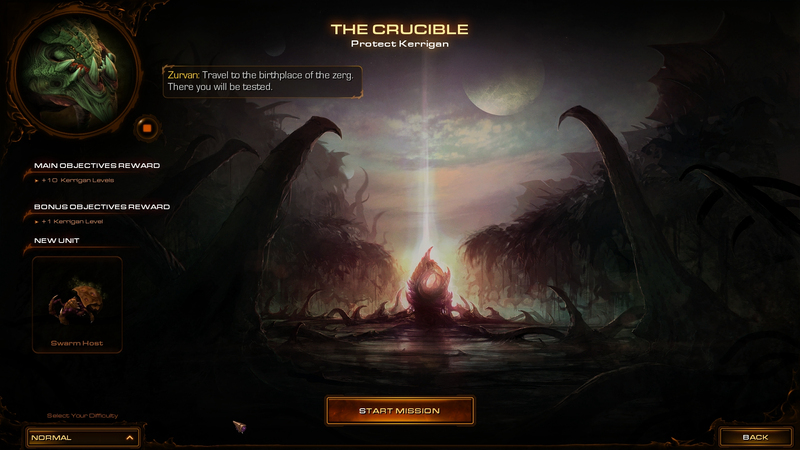 Primal zerg inbound. 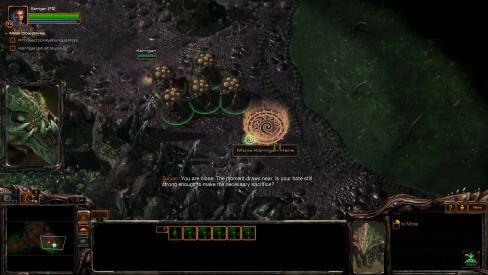 root swarm hosts to begin spawning. 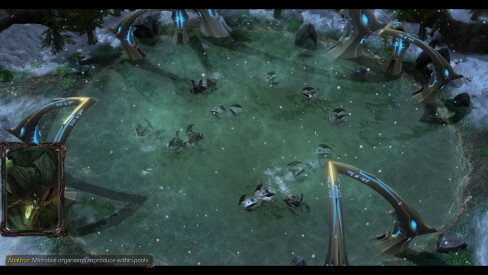 Izsha: Primal forces eliminated. Your path is clear. Zurvan: You are close. The moment draws near. Is your hate still strong enough to make the necessary sacrifice? Kerrigan: It’s … a pool. 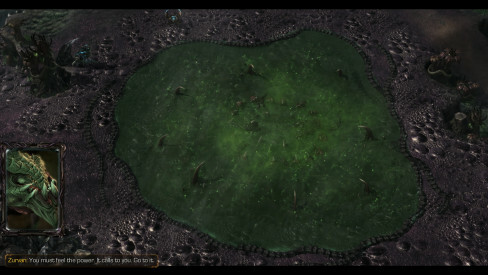 Zurvan: The first spawning pool. It existed before names. From this primordial place, the zerg arose. Within, one essence split into many. One devoured another and became stronger. the first zerg. You will have your power, and you will lose yourself. Evolve. Transform. Transcend. Abathur: Recommendation: avoid pool. Catalytic fluid will overwhelm queen’s body. Not strong enough. 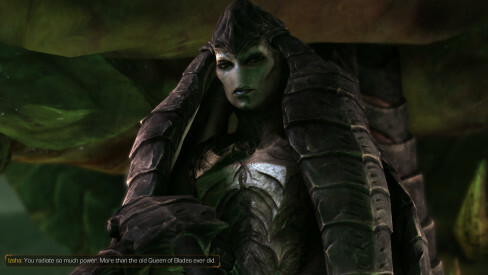 Kerrigan: The queen’s hate is strong enough. And if I survive, it will remake me. I will become more powerful than the old Queen of Blades. Izsha, defend the hive cluster and the chrysalis until I am done… or dead. [24:45] – Izsha: We need more swarm hosts… Morph more from the larvae at our hatchery. [24:01] – Izsha: The remnants of Brakk’s forces gather nearby. They are preparing to attack the hive cluster! Root our swarm hosts and crawlers by that entrance! [23:02] – Izsha: My queen, if you morph more drones you can gather minerals faster. [21:25] – Izsha: I sense another pack of primal zerg gathering across the basin. [21:20] – Yagdra: Hear me, broken zerg. You have killed Brakk, but his pack survives. I claim their territory, and their essence! [20:42] – Izsha: The primal zerg factions have engaged each other. We must remain focused on protecting the chrysalis. [20:18] – Yagdra: I have not forgotten you, broken pack. Your leader sleeps. She will not awake. My pack will feast upon your essence! [20:03] – Izsha: Yagdra’s pack is preparing to attack our hive cluster! Ready our defenses! [17:56] – Abathur: Entity Izsha. Have made important discovery. Primal essence gathering within pool. Can use. 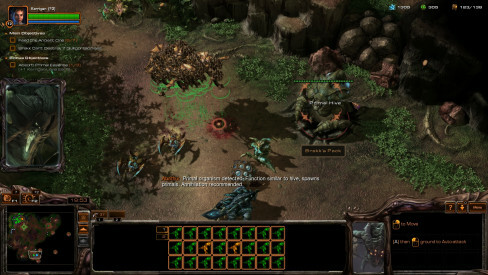 Spawn many locusts to defend hive cluster from primal attacks. 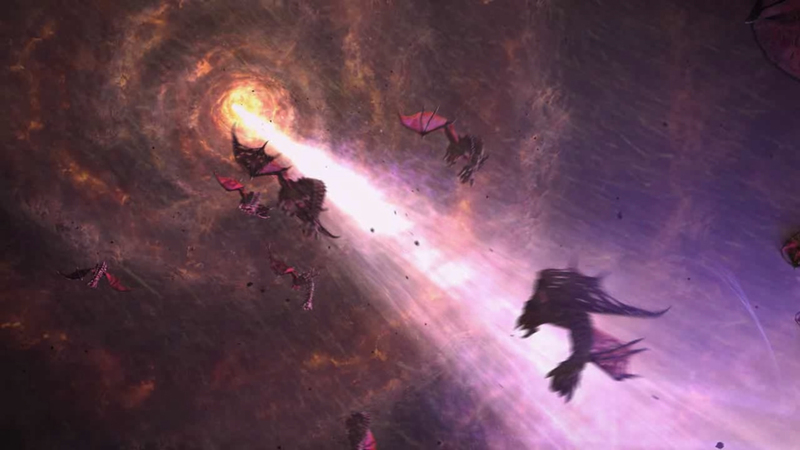 [17:41] – Another wave of primal zerg is inbound. Spawn the locusts now. 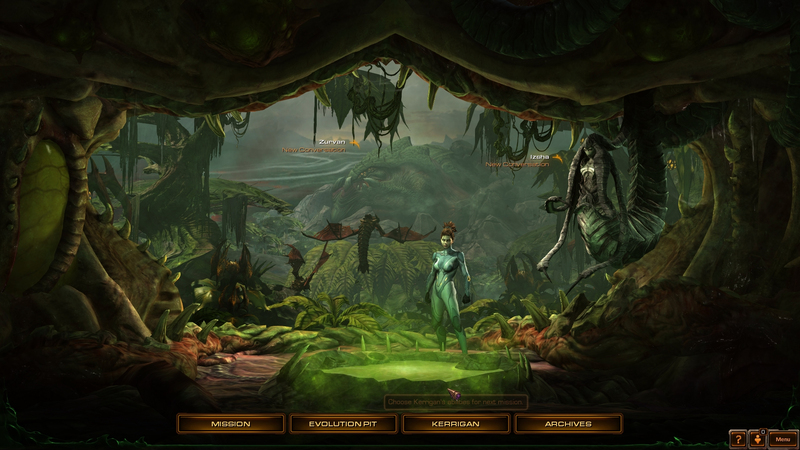 [14:23] – Izsha: I sense a massive primal zerg emerging. It seems to be wild. [14:16] – Abathur: Tyrannozor. Savage. Extreme physical prowess. Essence useful, must acquire. [14:07] – Izsha: That will not be easy. 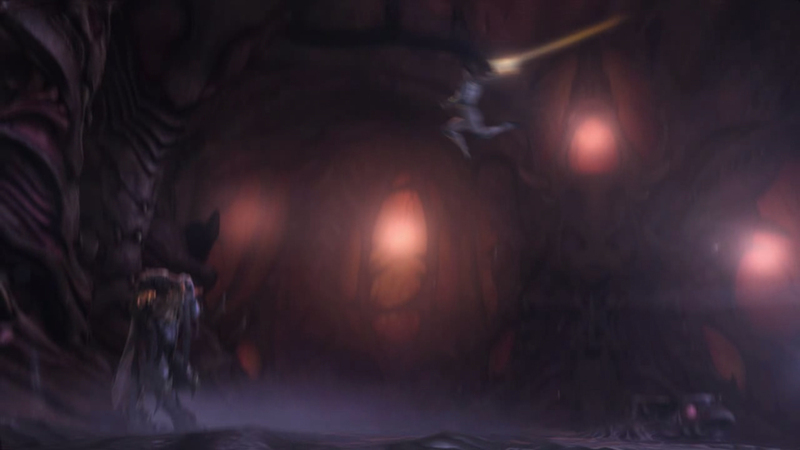 We will have to cross the battle between Brakk and Yagdra’s packs. 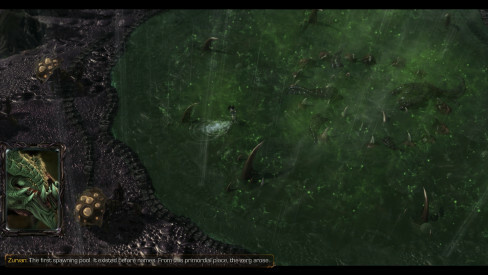 [13:34] – Izsha: Both packs are moving against us! Prepare for a pincer attack. 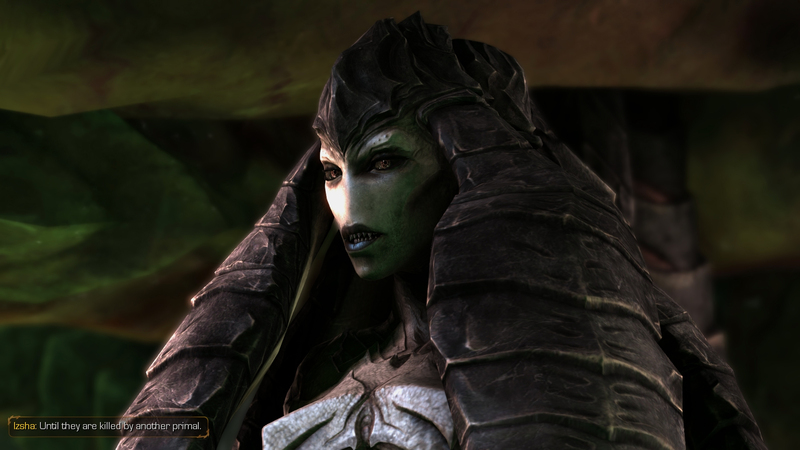 [12:29] – Izsha: Our queen’s metamorphosis is halfway complete! Maintain our defense! 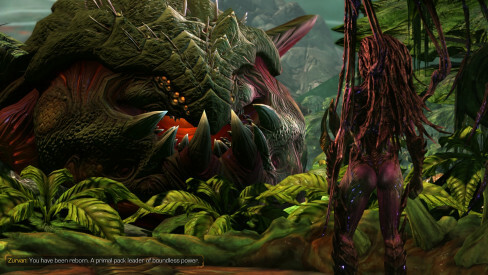 [7:29] – Izsha: The primal zerg are destroying the rocks near the chrysalis! [6:40] – Izsha: The primals have broken through the barricade! Defend the chrysalis! [6:13] – Izsha: The chrysalis has opened! Our queen is beginning to awaken! [4:49] – Izsha: My queen, completing bonus objectives will increase your power level. [3:18] – Yagdra: My pack is strong! We claim essence, we devour! The broken zerg remain! Collect their essence! kill! [3:06] – Izsha: Yagdra’s forces are gathering! They are converging upon the hive cluster! [2:06] – Izsha: The chrysalis is under attack! [2:03] – Abathur: Able to spawn locusts now. [0:55] – Izsha: Defend the chrysalis! The Swarm will prevail! 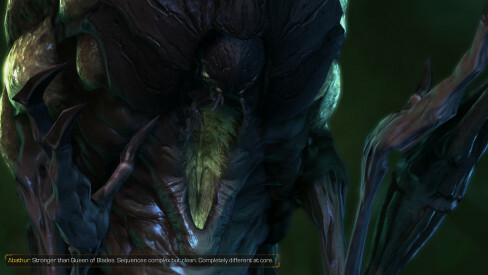 Kerrigan: The primal zerg say the Swarm is corrupted. 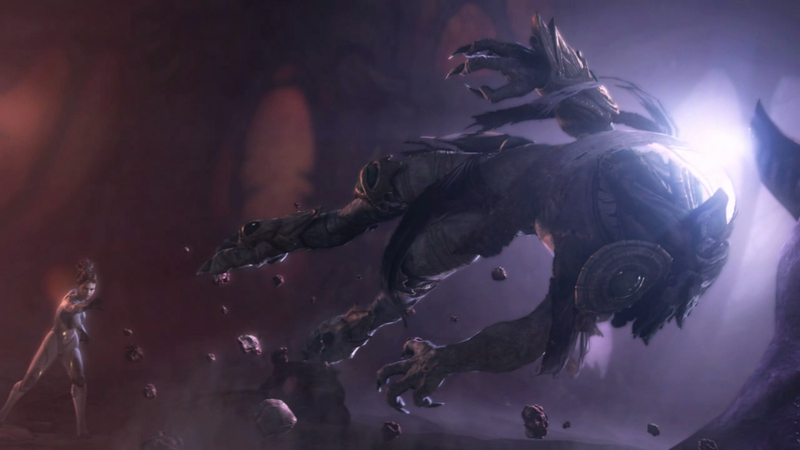 What did the fallen xel’naga, Amon, do to us? Zurvan: He desired our strength, the ability to steal essence. But we were independent… We would not follow. 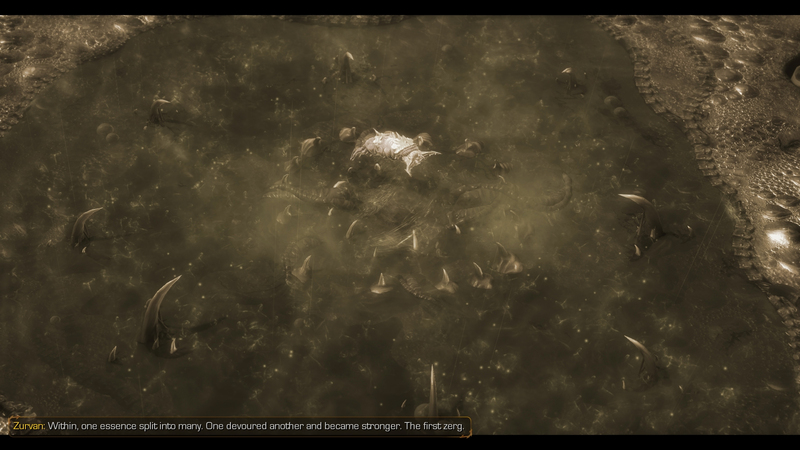 And so he bound the zerg to a single overriding will. They lost their identity, and became his slaves. 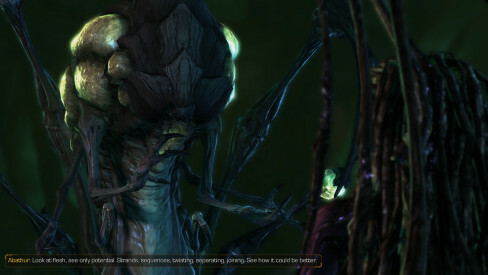 Kerrigan: The hive mind. That’s Amon’s corruption? 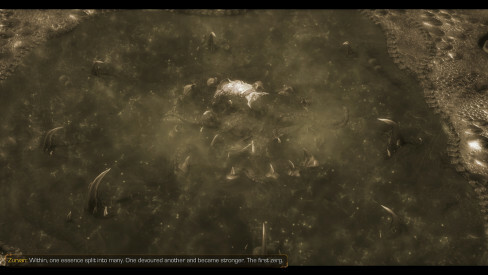 Zurvan: It is, and a terrible fate for a strong primal zerg. Izsha: My queen, why did we wake the Ancient One? Its power outstrips even yours. Kerrigan: The Ancient One is the key to unlocking the power of Zerus, and I need that knowledge. Izsha: Will it not destroy us? Kerrigan: It’s called a gamble. It’s something terrans do, when their instincts tell them the time is right. Izsha: I see. 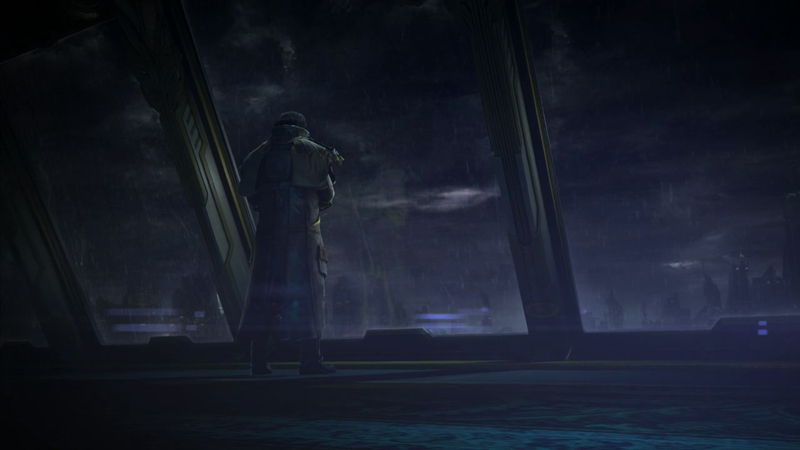 Just as when the terran James Raynor came to Char to return you to your original form? Kerrigan: Yes, just like that. The thing about gambles, Izsha, is that sometimes you lose. Abathur: Primal zerg. Unacceptable. Must be wiped clean. No trace left. Destroy primal zerg. 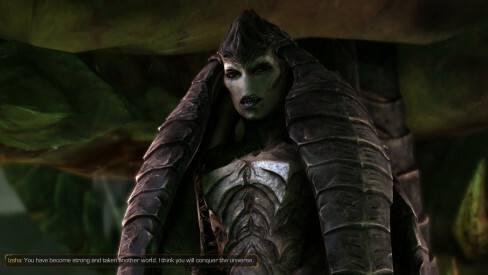 Kerrigan: What are you talking about? Abathur: Saw ranged primal zerg creatures on battlefield? Based on hydralisk! Primal zerg stole design from Swarm! Swarm on planet for hours, days, already being replicated! 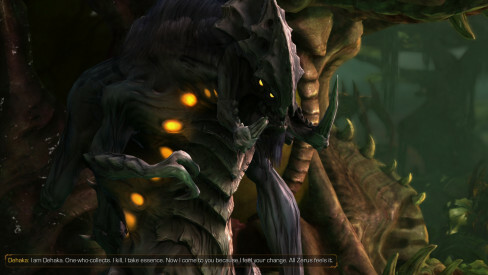 Kerrigan: Abathur, are you upset? Abathur: Unacceptable! Swarm’s power, ability to assimilate strengths. Primal zerg must not take from us! Kerrigan: Don’t worry about it. They’ll be on our side before I am done here. 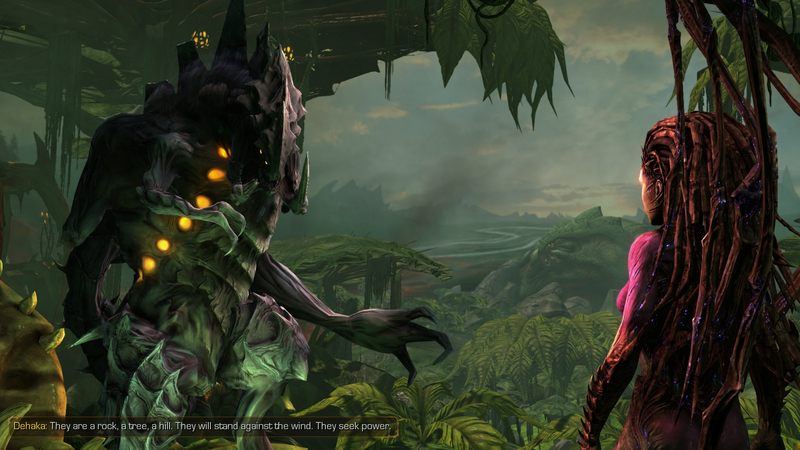 Izsha: The primal zerg are disturbed by our presence. They gather even now, preparing to destroy us. 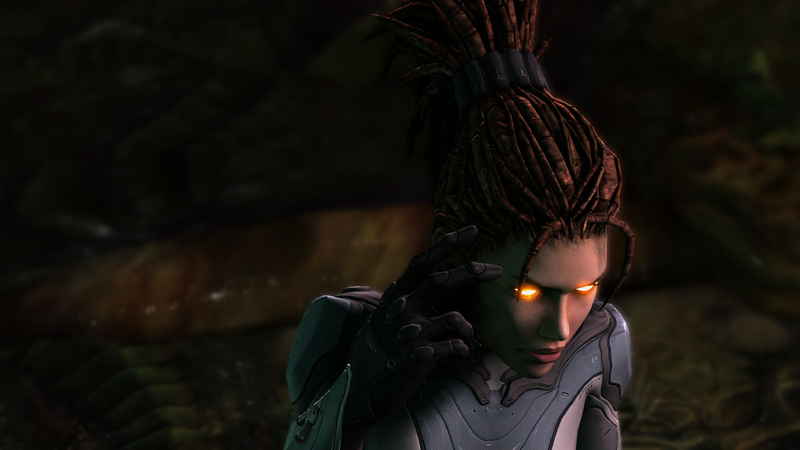 Kerrigan: I sense something. An ancient consciousness … sleeping. Zeratul: The Ancient One. A primal zerg who witnessed the creation of the Overmind. 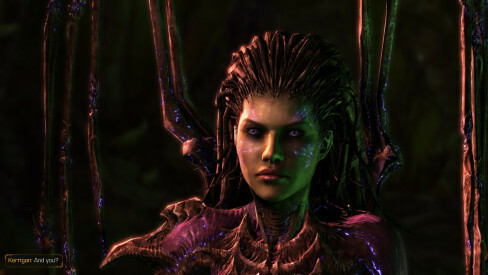 Kerrigan: You want me to awaken it, don’t you? 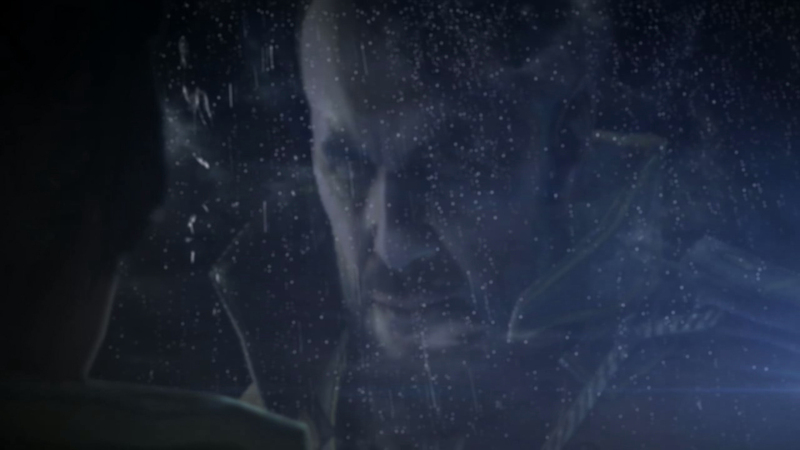 Zeratul: If you truly seek the power of Zerus, you will need the Ancient One. Izsha: My queen, enemy primals are massing nearby. They are going to attack us. 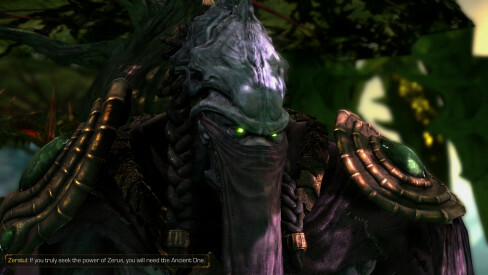 Zeratul: They wish to stop you from speaking with the Ancient One. What will you do? 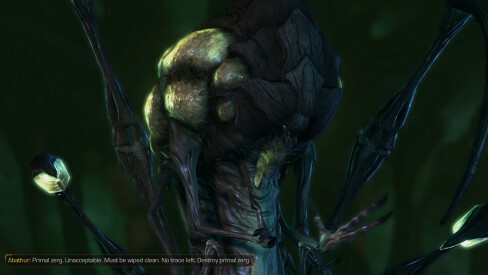 Kerrigan: What my enemies fear most. Always. Zeratul: YOu are on the path, and no longer need my guidance. You will not see me again, Kerrigan. 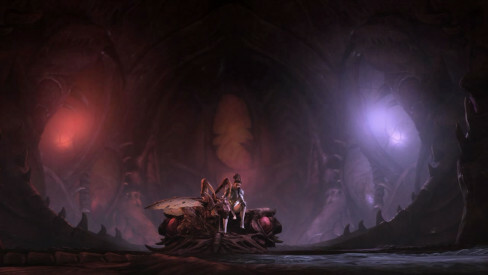 Kerrigan: So this is the Ancient One. Izsha: To awaken this creature, we must feed it. Kerrigan: There’s a lot of biomass here. We’ll kill these quillgor and have drones harvest meat from their corpses. Once the drone is done harvesting, it will drag the biomass to the ancient. Brakk: Brakk speaks now! 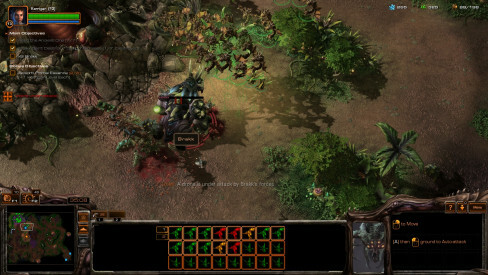 You intrude on my territory, corrupt zerg! We will devour your flesh! Izsha: Warning. 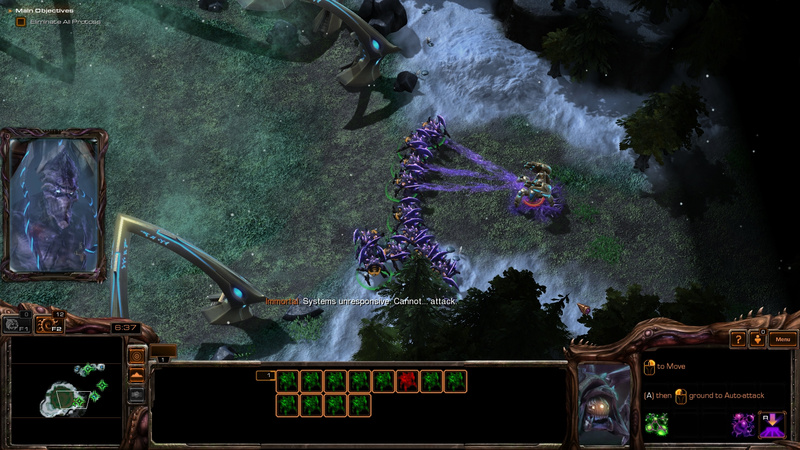 A force of primal zerg fliers is preparing to assault the hive cluster. Abathur: Mutalisks reconstituted. Ready for your armies. Will destroy primal guardians. 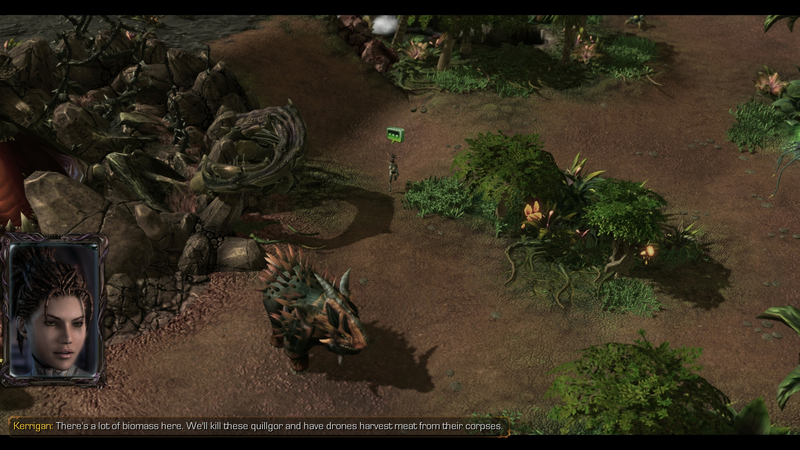 Izsha: Primal zerg forces are massing nearby. They are likely to attack again. 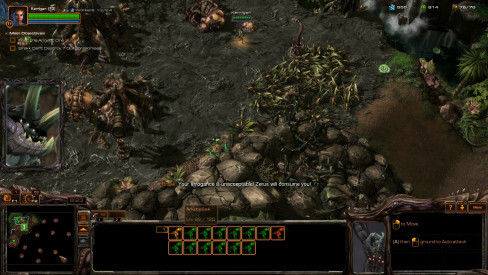 Kerrigan: This pack of quillgor is our first target. Let’s move out. Izsha: Quillgor located. We must move quickly if we are to secure their biomass. Izsha: A drone can harvest biomass from this quillgor. The process is slow, and our drone will be vulnerable. We must protect it while it harvests. Kerrigan: We need to harvest this biomass quickly! Brakk: She must not wake the ancient! Destroy the meat! Leave her nothing! Kerrigan: We have to stop them. Our forces can intercept their raiding parties. Izsha: Primal zerg forces incoming. Our drone must be protected. Primal forces are attacking quillgor biomass. Brakk: Your arrogance is unacceptable! Zerus will consume you! 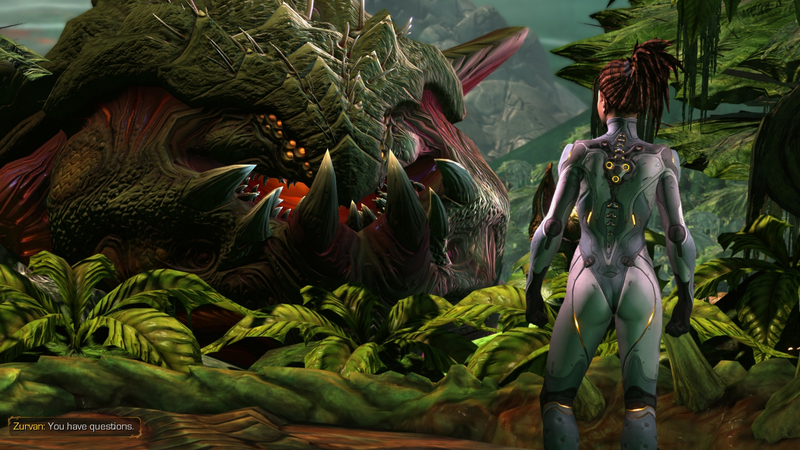 Kerrigan: I’m sensing something primal nearby, but it’s small. Abathur: Primal essence pool. Strong sequences. Approach, absorb essence. Will augment strength. Kerrigan: I feel stronger. This must be the power Zeratul spoke of. 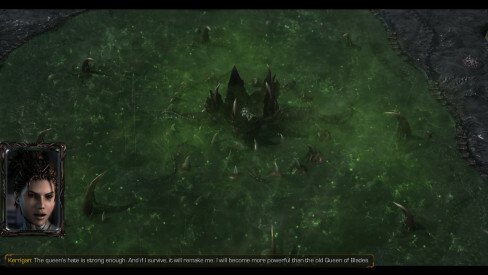 Izsha: Brakk’s forces have destroyed quillgor biomass. Brakk: Your Swarm is mindless. 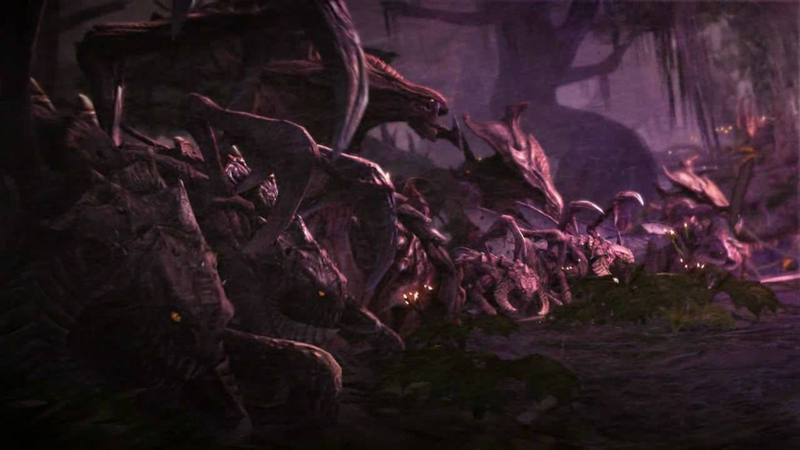 The primal zerg descend upon you! 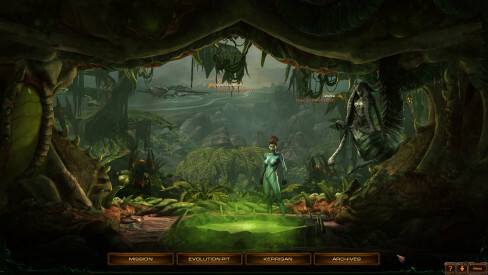 Izsha: It is dangerous to harvest from multiple corpses. 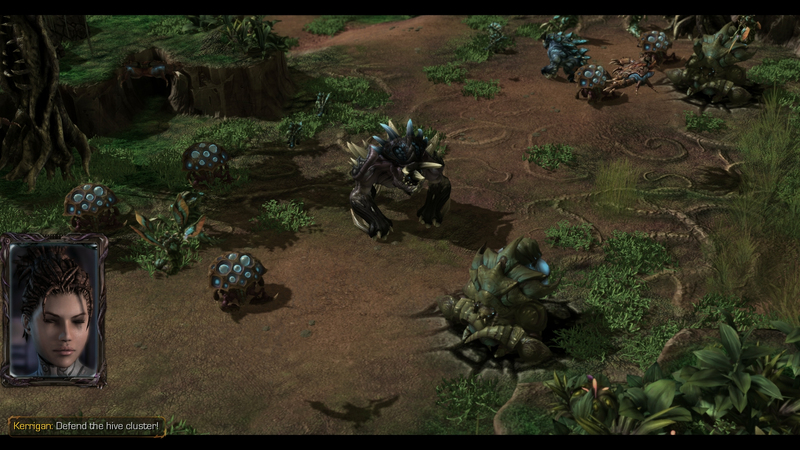 The primal zerg are sure to attack our drones. Brakk: You grow greedy! It shall be your downfall! Abathur: Primal organism detected. Function similar to hive, spawns primals. Annihilation recommended. Izsha: A drone is under attack by Brakk’s forces. Izsha: Primal forces are attacking quillgor biomass. Izsha: We should morph units that can attack flying units. Morphing hydralisks or queens will allow us to destroy the enemy’s fliers. Brakk: This ends now, corrupt zerg! I will kill you myself! 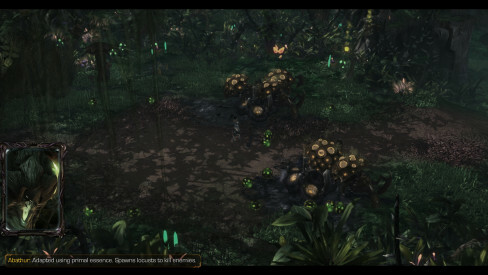 Kerrigan: Defend the hive cluster! Brakk: Your empty minions are no match for the might of the primal zerg. Kerrigan: Ancient One! I am here for the power of Zerus. I will sacrifice anything to achieve my goal. You will help me. Ancient One: Your Swarm bears the mark of Amon, the fallen xel’naga, who came to Zerus long ago. He forged the zerg into a weapon, and took them away. Yet some of us were hidden, overlooked. We multiplied. We remain pure. 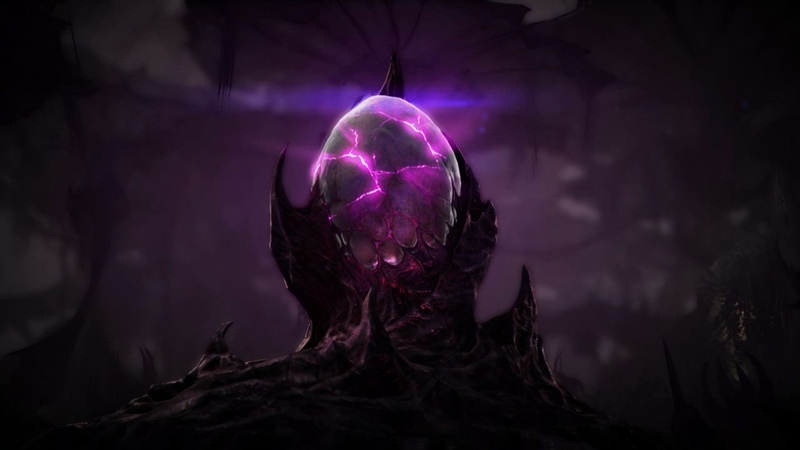 If you seek our power, you must become primal zerg. You must become pure. 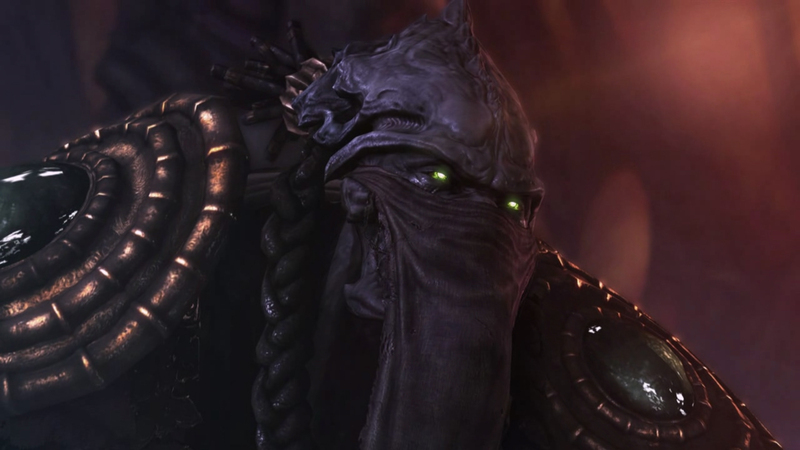 Zeratul: Zerus, birthworld of the zerg. 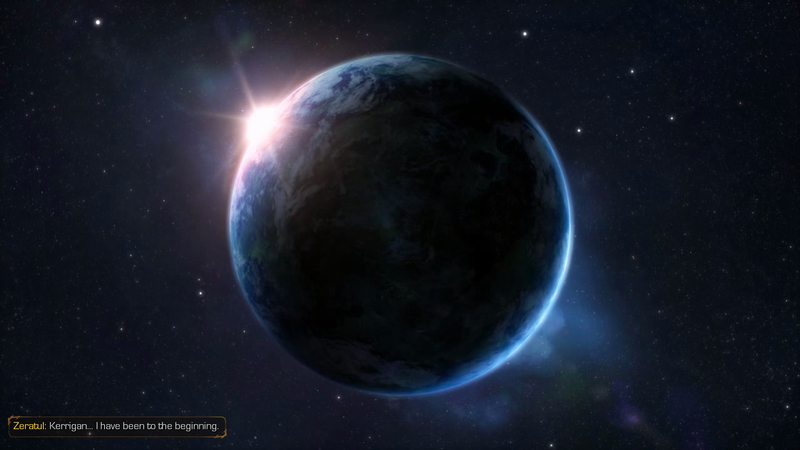 It lies far beyond the Koprulu sector, where no terran has ventured. 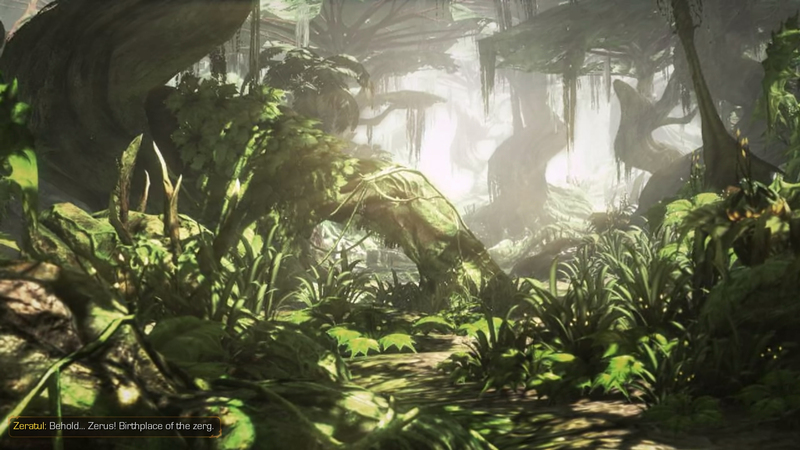 You must go to that ancient place, Kerrigan. Learn its secrets and take its power. The Voidseeker and the Leviathan arrive to planet Zerus. 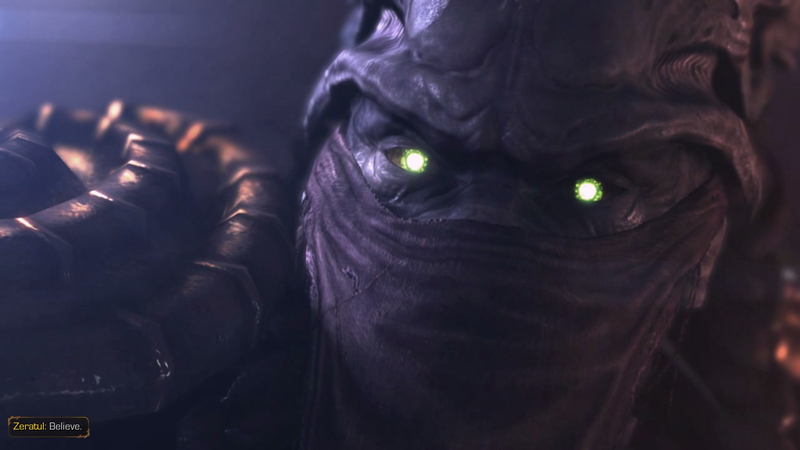 Zeratul: The power of Zerus called you here. Kerrigan: My need to see Mengsk dead called me here. These zerg will help me destroy Korhal. 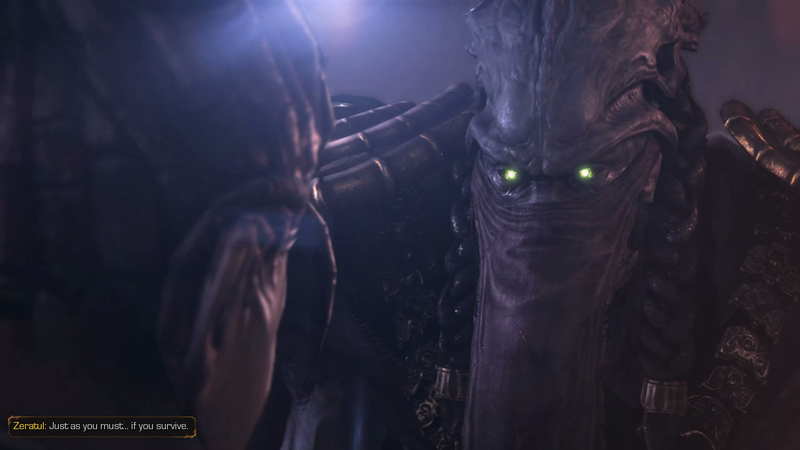 Zeratul: You must let Zerus remake you, Kerrigan! The final war nears, and there is little time. Kerrigan: I don’t have to do a damn thing. I will not be a pawn in your prophecies. Zeratul: But you will do anything to have your revenge? 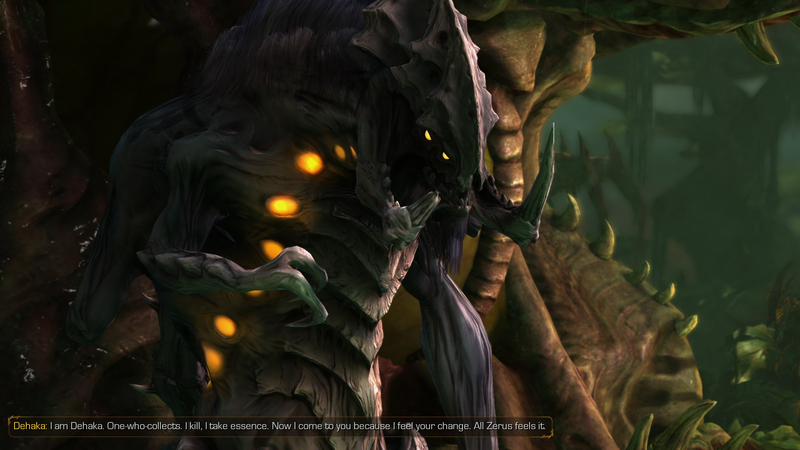 Zeratul: Then that is enough. 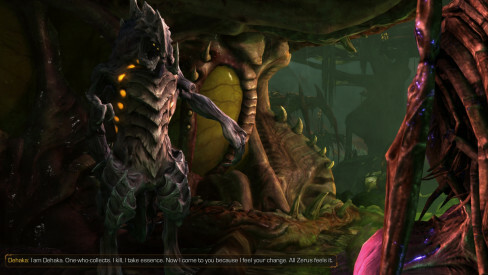 Kerrigan: Why are you helping, Zeratul? You have more cause to hate me than most. 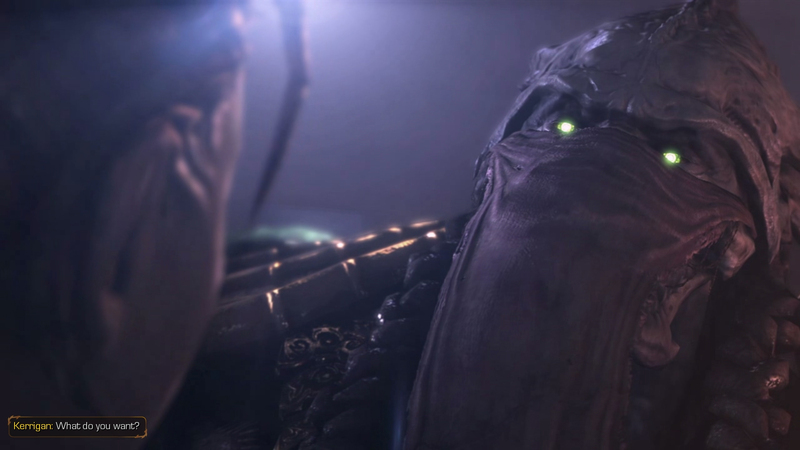 Zeratul: The xel’naga wish you restored as the leader of the Swarm. 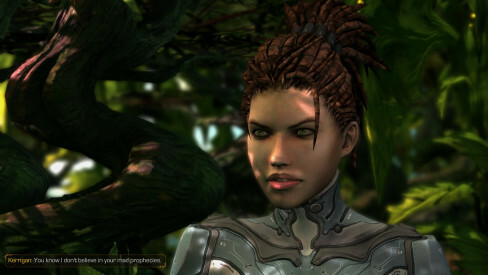 Kerrigan: You know I don’t believe in your mad prophecies. 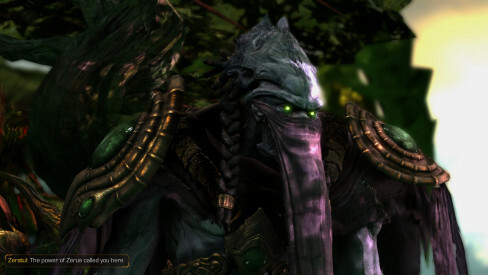 Zeratul: Your belief is not required. I act for the greater good, though it earns me the hatred of my own people. 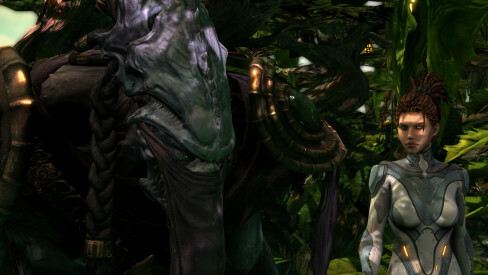 Kerrigan: Spare me your self-pity, Zeratul. Everyone has to make peace with their own choices. 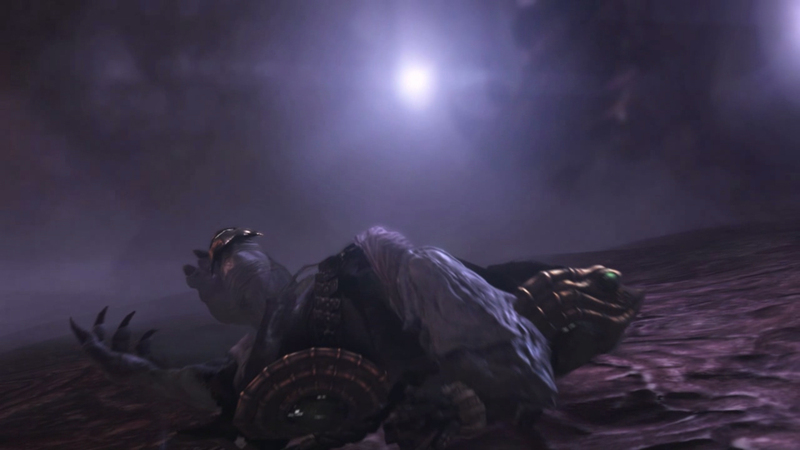 Zeratul: I made my peace long ago. When we are done here, I will return to my people, and accept their judgment. Kerrigan: We all have to pay for our actions someday. I guess your day is almost here. 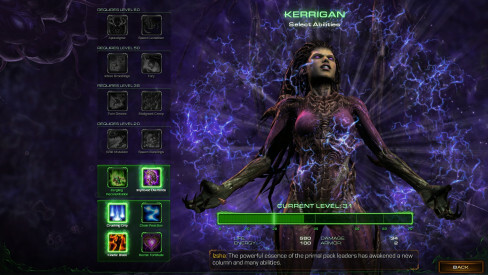 Kerrigan: I’m looking through the eyes of my overlords. These primal zerg are fascinating. They show no signs of age. Izsha: All organisms age. Even zerg. Kerrigan: But the primals feed off the essence of individuals. They’re in a state of constant evolution. They don’t die. 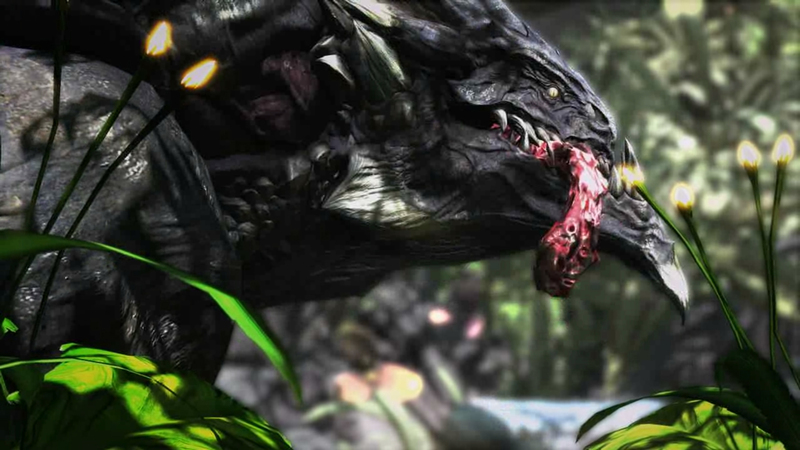 Izsha: Until they are killed by another primal. Kerrigan: True. The most successful hunters among them must be incredibly ancient. And incredibly dangerous. 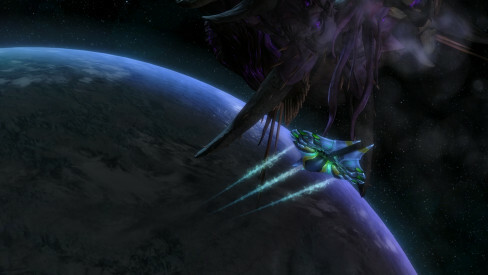 Note: The Voidseeker approaches the zerg Leviathan. Kerrigan is meditating and detects a familiar psionic presence. Her zergling pet reacts. Note: Zeratul decloaks. Kerrigan rushes toward him with anger, and punches him in the chest, followed by a roundkick to the face which knocks him back violently. 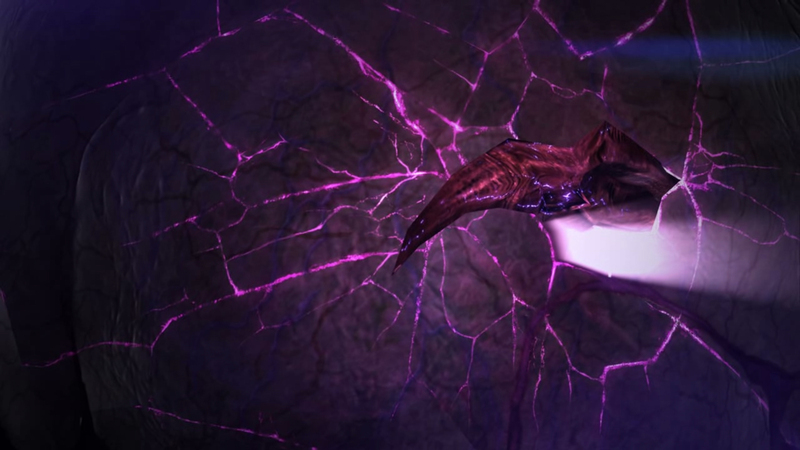 Before Zeratul lands, Kerrigan telekinetically stops his body mid-air, and slams him against a pillar behind her. 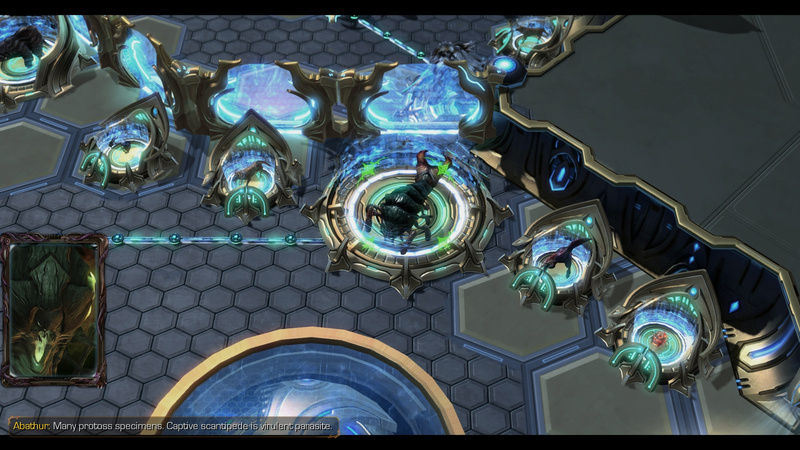 Zeratul lands on his knees and hands. Kerrigan jumps about 15 feet high like a superhero and her right fist flares up with telekinetic force slamming against Zeratul with such a strength his shield resonates as if hit by a sonic boom. 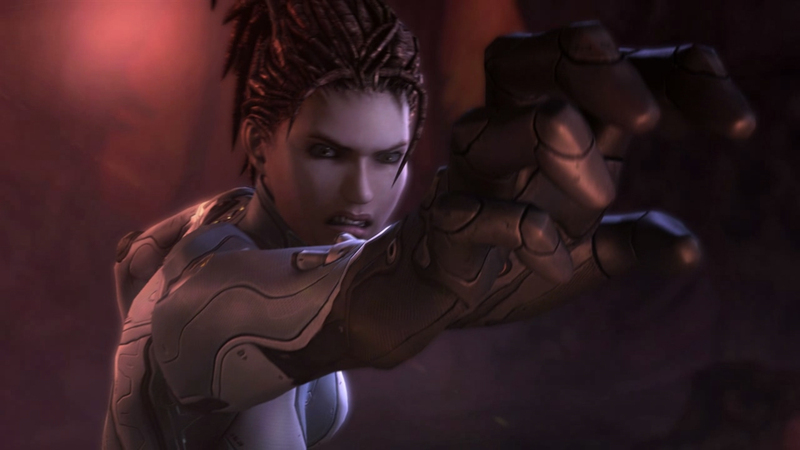 Kerrigan is pushed back with the momentum of her punch. Kerrigan runs toward Zeratul and lands another telekinetic-powered punch on his chest, catapulting him clear through the pillar. 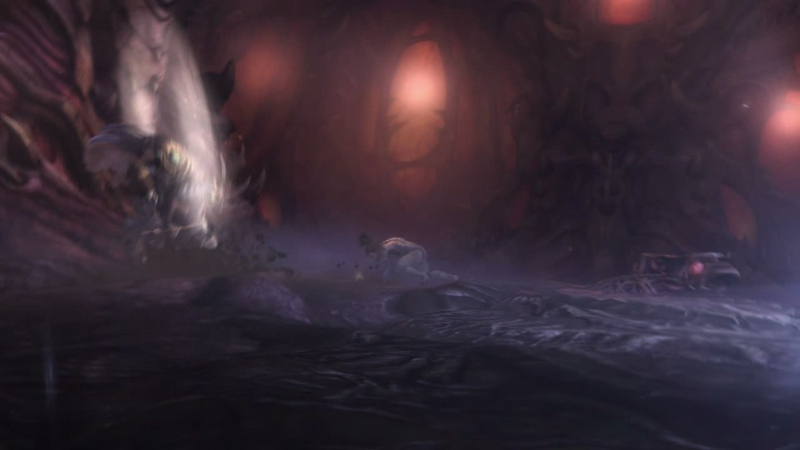 Zeratul’s body finally lands on the ground on his back. 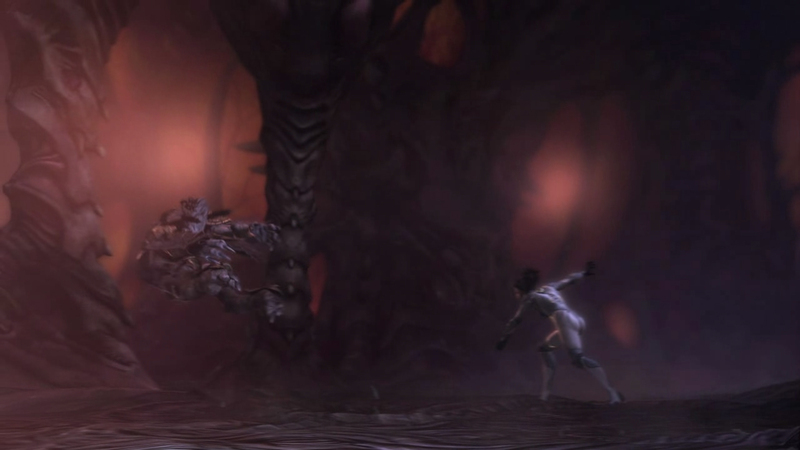 Kerrigan grabs his chest piece and pulls him slightly off the ground. Kerrigan: What do you want? Note: Zeratul doesn’t respond. 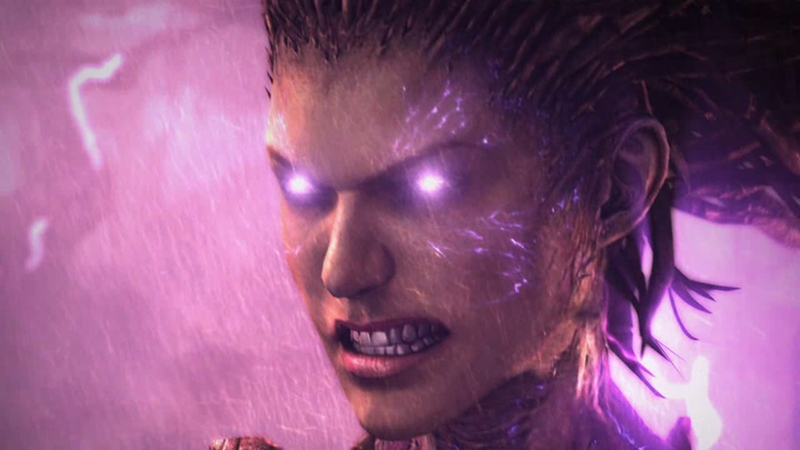 Kerrigan becomes frustrated and anger shoots through her spine, powering another telekinetic punch aimed at Zeratul’s face. 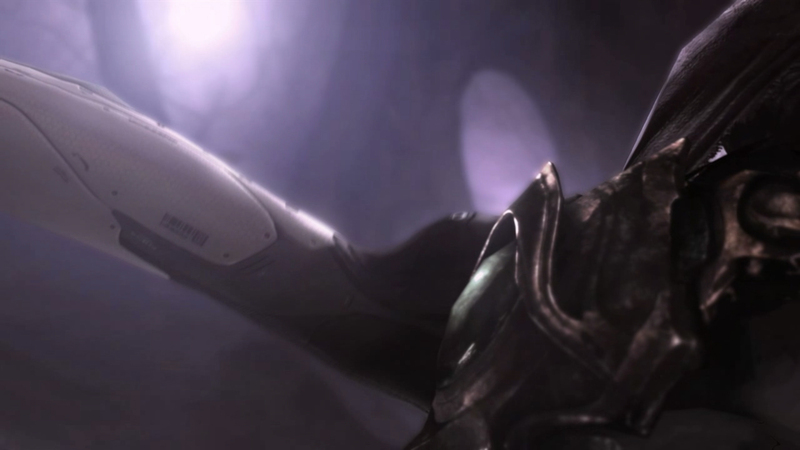 Before she lands the punch, Zeratul’s right hand grabs her entire face to mindmeld. 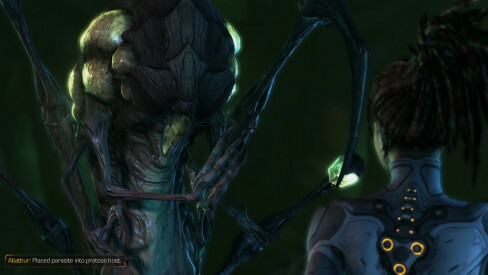 Note: The camera aims on Kerrigan’s right eye, and zooms in into her corneas, showing a point of view that warps in into an unknown space sector. 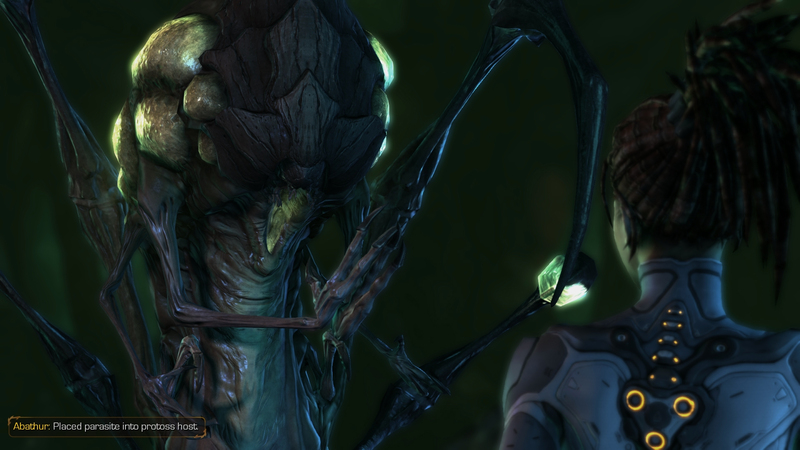 Kerrigan is now seeing through the eyes of Zeratul aboard the Voidseeker. A green planet appears before her. 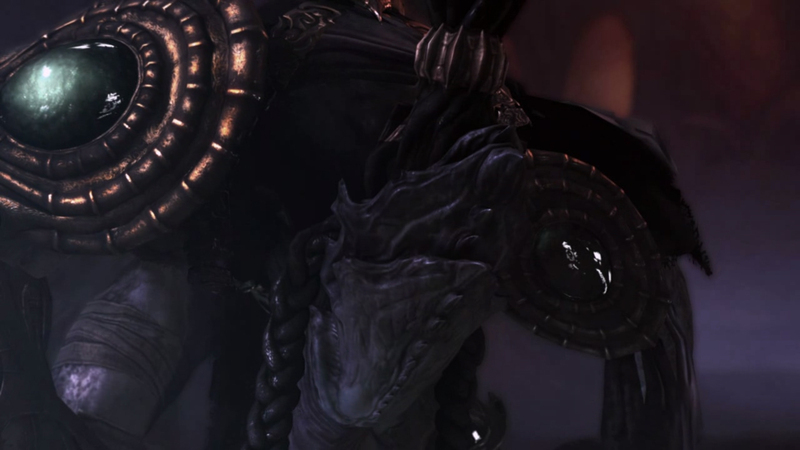 Zeratul: Kerrigan … I have been to the beginning. Behold … Zerus! Birthplace of the zerg. 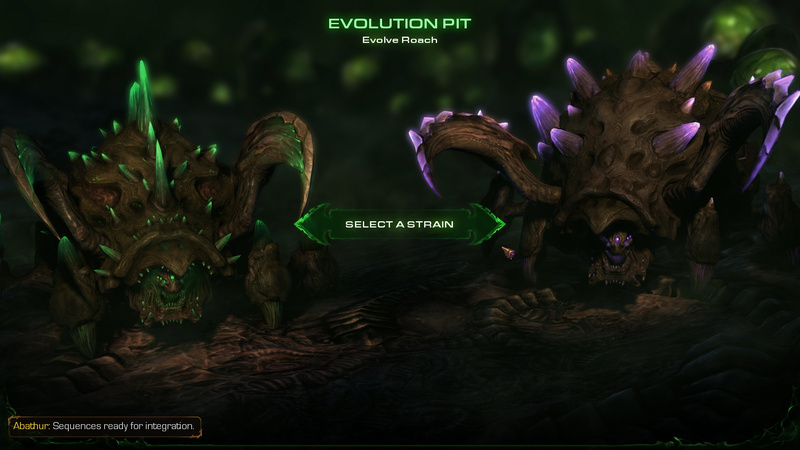 Here the zerg evolved, and here the dark one altered them. 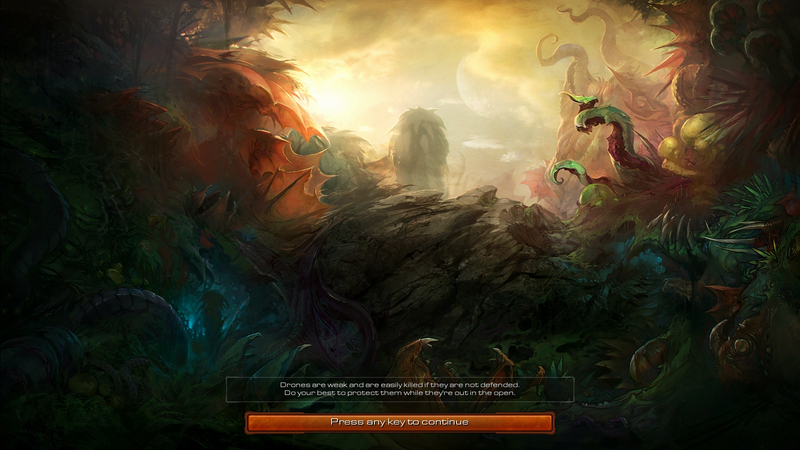 Those left behind are the primal zerg. They fight. They kill. They evolve. 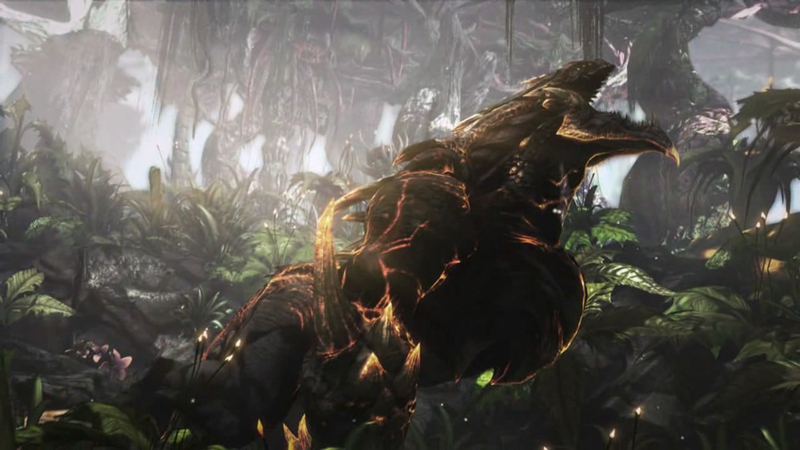 Note: The scene shown is two primal zergs fighting each other. One wins, eats its contender and evolves in real-time growing new eyes, and other features throughout its body. 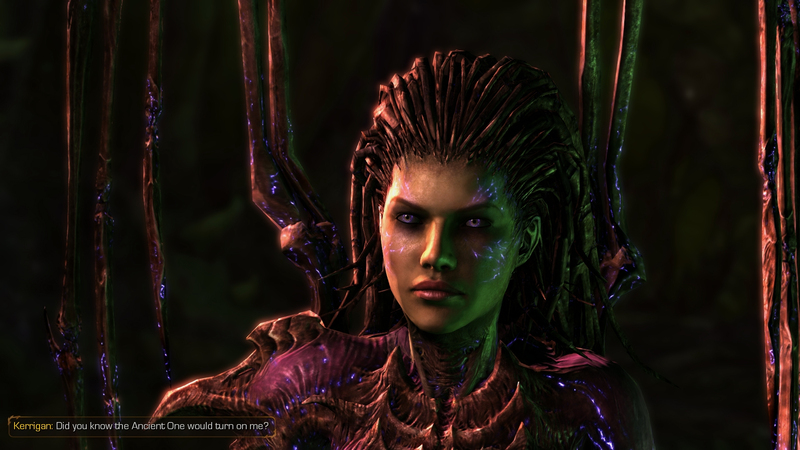 The scene zooms out into orbit and through Kerrigan’s right eye back to the here and now, while Zeratul’s hand rests on her face. Zeratul: Just as you must … if you survive. 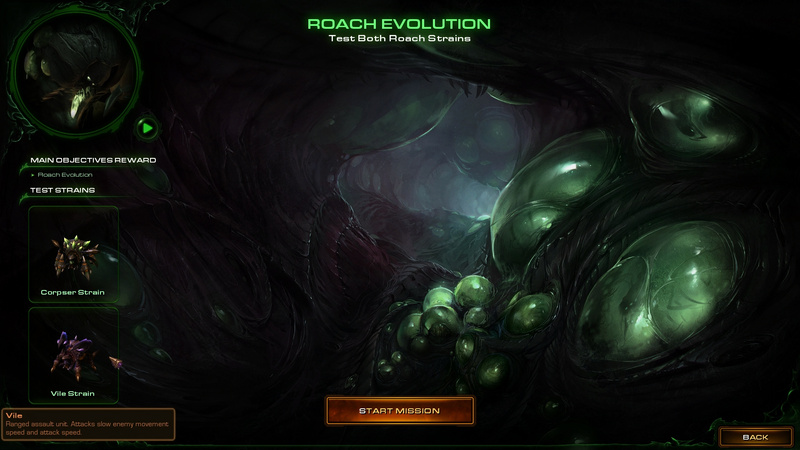 Abathur: Roach strain ready for augmentation. Protoss research facilities discovered. Experiments within useful to evolve Swarm. Must acquired. Destroy protoss. Improve Swarm. Abathur: Planet Cantar. 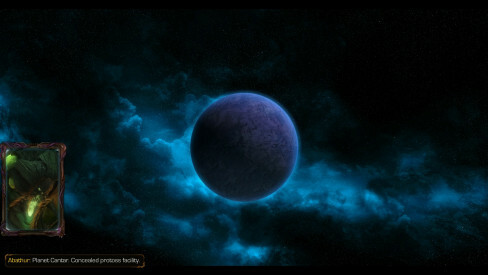 Concealed protoss facility. Abathur: Many protoss specimens. Captive scantipede is virulent parasite. 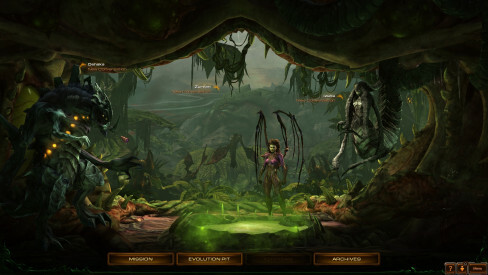 Kerrigan: Well then, why don’t we let it out to play? Abathur: Implants parasites into host. Erupt from corpse. Essence must be ours. Protoss must not destroy! Abathur: Essence acquired. Roaches modified with parasitic sequence. Corpser strain: implants roachling parasite. Erupts from enemy’s corpse. Kerrigan: Push forward. Leave no survivors. 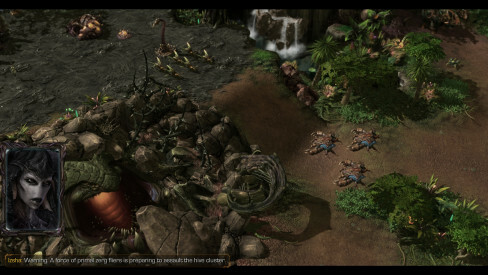 Kerrigan: Let the roachlings attack the enemy first! Abathur: Protoss destroyed, scantipede essence secure. Abathur: Planet Mehlus IV. Environment used to guide evolution. Microbial organisms reproduce within pool. Generations of roaches ordered to consume. Most … organs sieze up. Die. Survivors adapted. Formed symbiotic bond with microbes. New strain: vile roach. Ready for command. 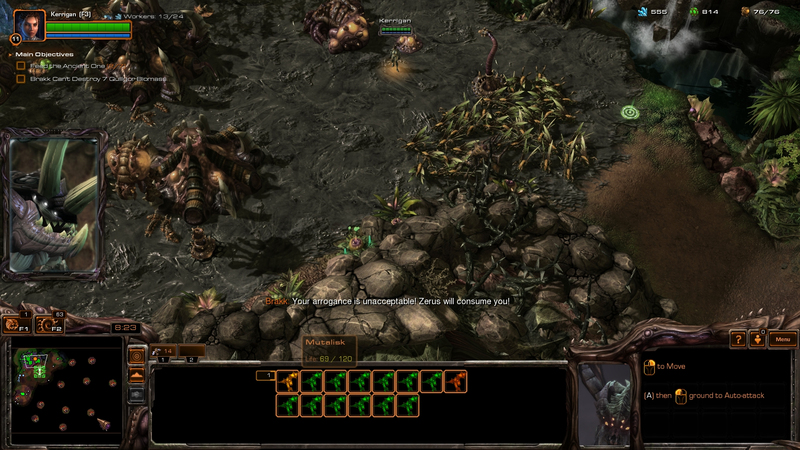 Kerrigan>: I sense protoss forces nearby. Let’s see these new roaches in combat. Abathur: Vile strain: acid saliva coats enemy. 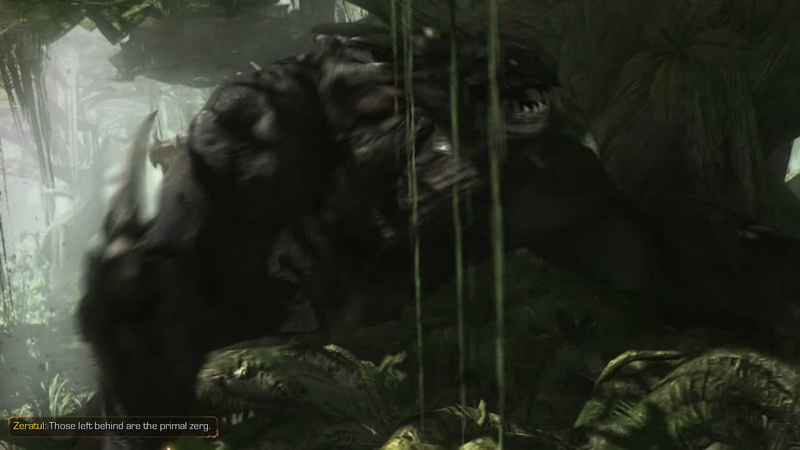 Slows movement, slows attacks. 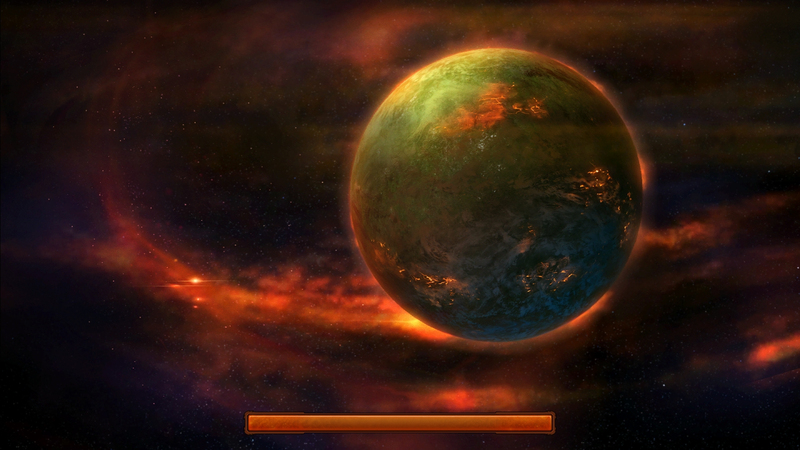 Immortal: Systems unresponsive. Cannot… attack. Abathur: Vile strain successful. 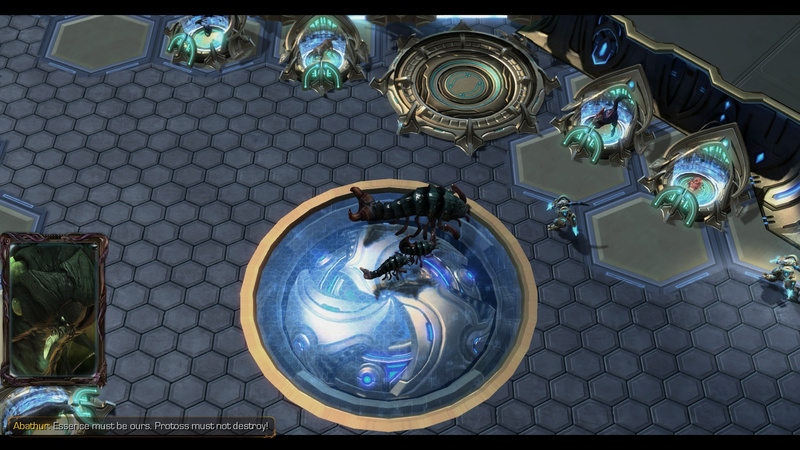 Protoss eliminated. Must prepare sequences. Returning to evolution pit. Abathur: Sequences ready for integration. Await decision. Evolution complete. 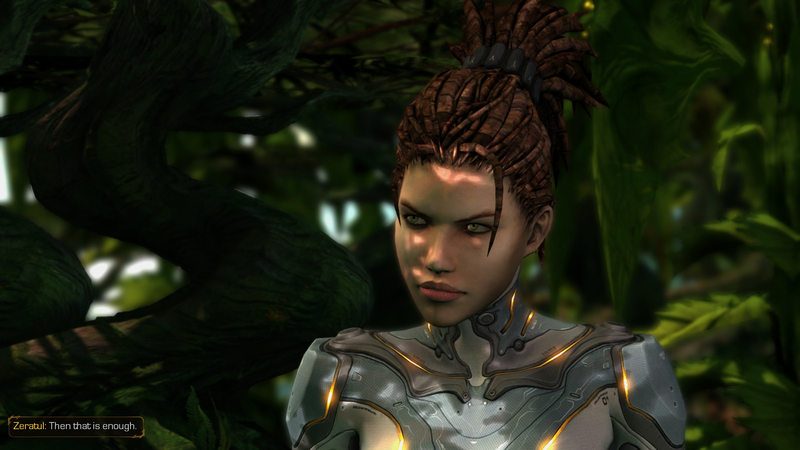 Kerrigan: There’s no turning back now. Izsha: I do not understand. Kerrigan: The protoss will never forgive what I’ve done here. 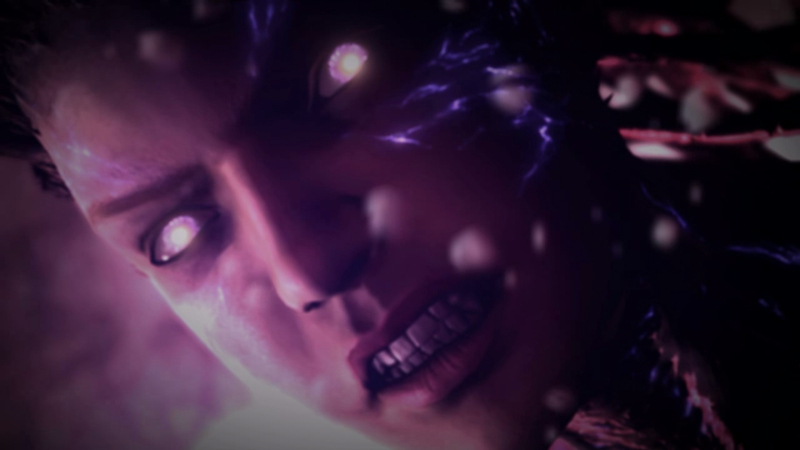 If my becoming human again eased their fears … well, I’ve given them new reasons to be afraid. But I’m not going to wait for them to come after me. I’ll strike first. 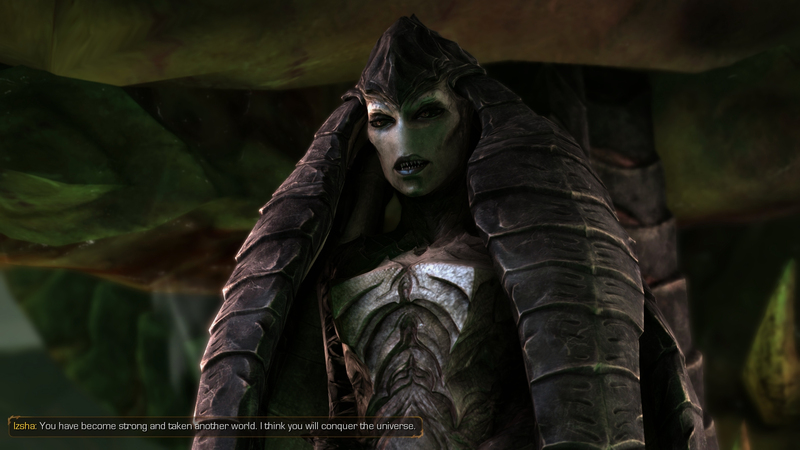 Izsha: Our leviathan is able to travel to another world at your command. 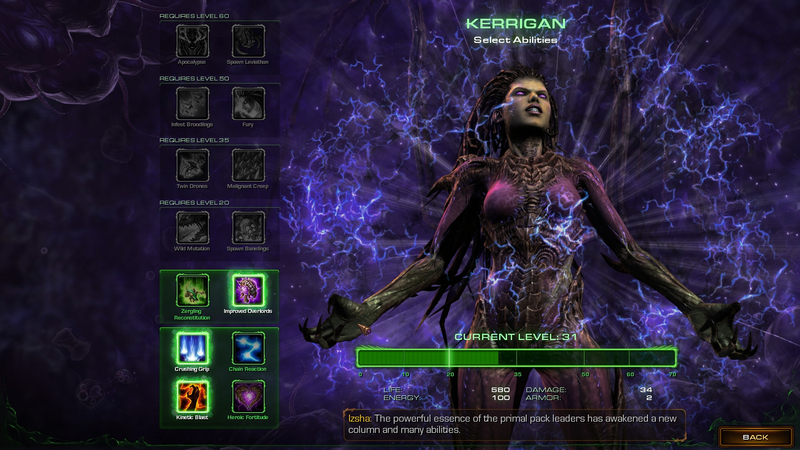 Kerrigan: It is done. The Golden Armada will never know we were here. Izsha: I am glad that protoss is no longer aboard our leviathan. Her psionic presence was disturbing. 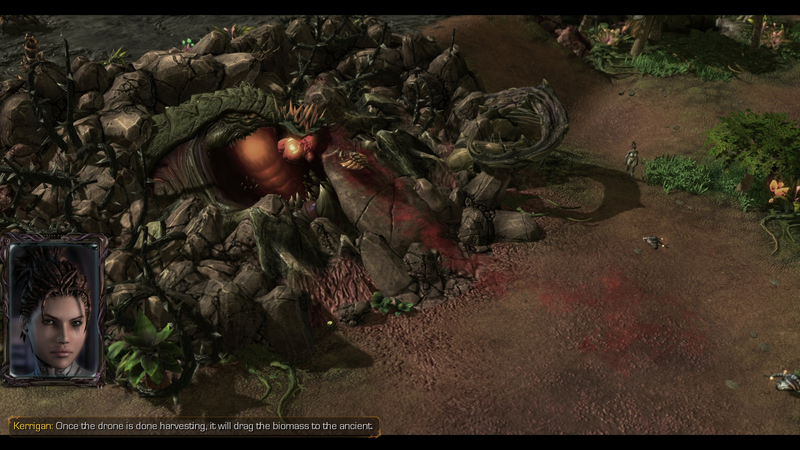 Kerrigan: She died bravely, trying to save her friends. Izsha: Why do you care how the protoss died? 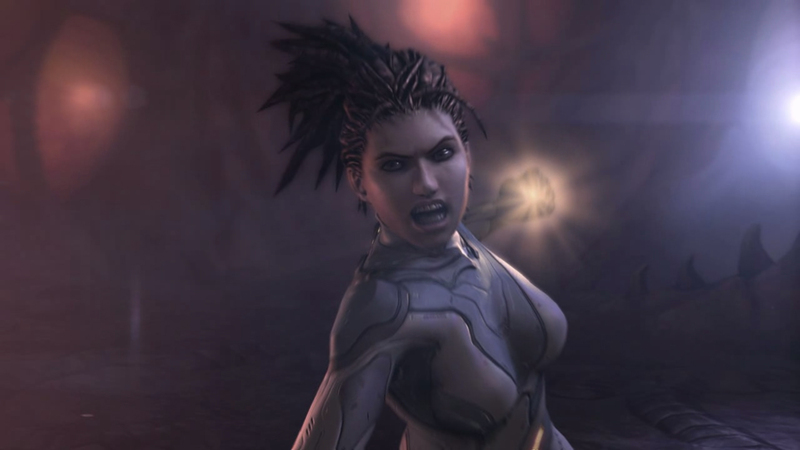 Kerrigan: I will kill anyone in my way. That doesn’t mean I enjoy it. Izsha: Even Arcturus Mengsk, my queen? Will his death bring you no joy? Abathur: Placed parasite into protoss host. Kerrigan: Yes. What about it? Abathur: Clever. Lateral thinking. 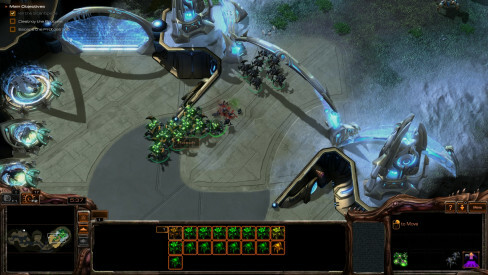 Protoss not able to be infested. But can still be host to foreign organism. Origins of parasite unknown. Kerrigan: I made it, Abathur. You’re not the only one who can spin sequences. Abathur: Revelation. Will continue work.